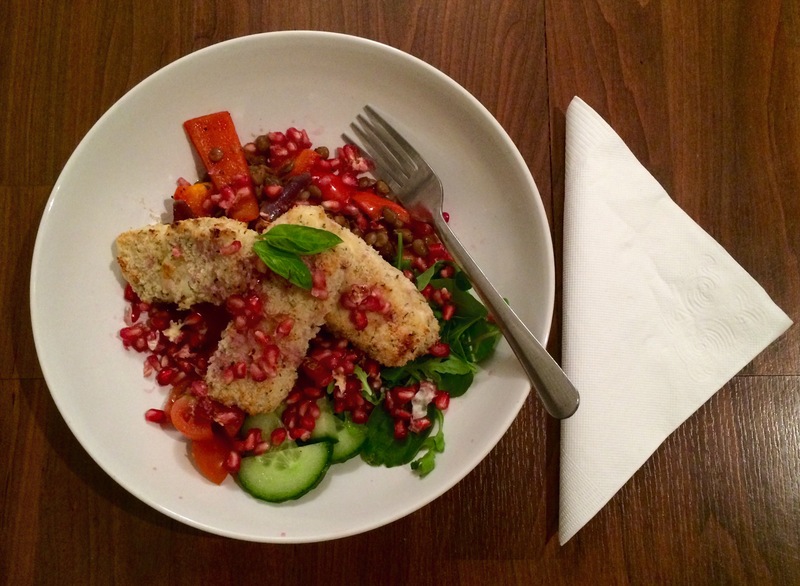 Thick slices of halloumi encased in crunchy panko breadcrumbs are scattered with sweet yet tart pomegranate seeds. The taste and texture of these two main players contrast each other perfectly. 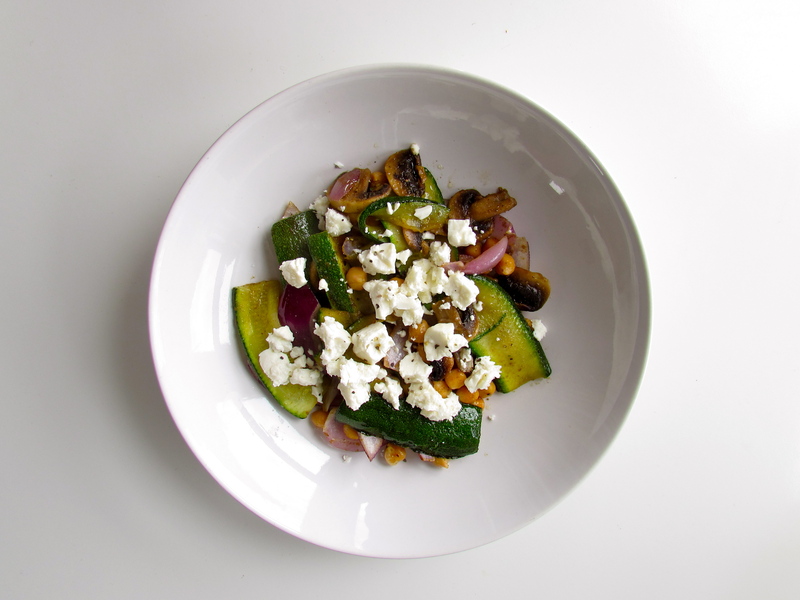 Served with warm, earthy green lentils, this colourful autumnal salad is packed with a wealth of fine flavours. Pomegranate. A fruit I’ve never bought in its raw form. I’ve encountered it in juices and in cocktails, but I’ve never prepared one myself. The inspiration for this dish came from Petek, a Turkish restaurant in Finsbury Park I went to recently where I had a starter of halloumi scattered with pomegranate seeds. Pomegranates are a superfood. They add a lot of nutritional value to your diet containing vitamins, iron and a good source of fibre. And the ruby red seeds are so vibrant, they inject a lovely colour on to your plate of food. I’ve wanted to make breaded halloumi for some time now, and when I came across Sita’s Simply Delicious recipe for panko halloumi sticks, I was so intrigued by the use of yogurt as a binding agent rather than egg, that I got my hands on some panko breadcrumbs stat. Panko breadcrumbs are Japanese-style breadcrumbs. They’re bigger than standard breadcrumbs and are lighter in flavour. They seem to be en vogue in the food world at the moment, as they keep cropping up in recipes I come across, not just for Asian dishes such as katsu curries but also in fishcakes and other veggie dishes. I got mine in Sainsbury’s. Slice the halloumi block in half lengthways. Then slice each half into three lengthways, so you have six chunky pieces. Heat the oven to gas mark 8. Get three small to medium sized bowls or tupperware and add flour to one, yogurt to the second and the panko breadcrumbs and dried parsley to the third. Give the breadcrumbs and parsley container a bit of a shake so the parsley is dispersed evenly throughout the breadcrumbs. Line them up in this order as your production line. Get a baking tray ready to pop the halloumi onto once you’ve breaded it. Now here’s the fun part. Take your first slice of halloumi and dip it into the flour, making sure to coat all sides thoroughly. Repeat the process for the yogurt, making sure you get a healthy amount on all sides so there’s enough moisture for the breadcrumbs to stick to. Lastly, coat the halloumi slice in the breadcrumbs, again making sure you coat all sides thoroughly, and pop the slice onto the baking tray. Repeat this process for the other halloumi slices. When you’ve breaded all of your halloumi, put the baking tray in the oven and cook for 20 minutes. Meanwhile, prepare the lentil salad. Cut the onion and pepper into thick slices lengthways. Pour the olive oil into a frying pan and put on a medium to high heat. Add the pepper and onion and fry for 10-15 minutes, stirring frequently. 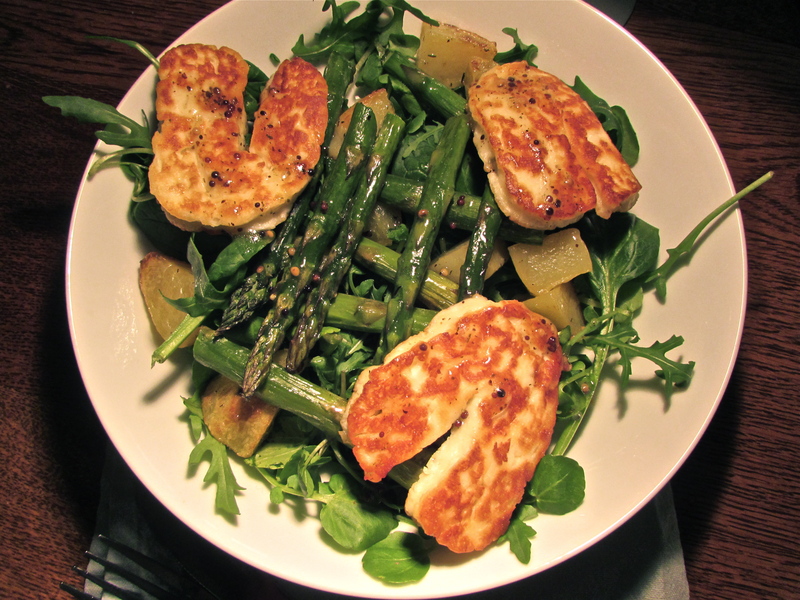 After 10 minutes of the halloumi being in the oven, flip the slices over so they cook on both sides evenly. When the pepper and onion have cooked, reduce the heat and pour in the lentils and dried basil. Season well and mix together. Cook for 5 minutes. Check on the halloumi slices. If they’ve browned up nicely, then they’re ready to serve. But I found that they were a bit reluctant to brown up. If this is the case for you, then put them under the grill on a high heat for a further 5 minutes to get that lovely golden colour. Slice the pomegranate in half and scoop the seeds out into a bowl using a fork. Place the salad leaves, cucumber and tomato together on the side of the plate or bowl. Add the lentil mixture to the other side and arrange the halloumi slices on top. Scatter over the pomegranate seeds and garnish with a bit of fresh basil if you’ve got it. Tip: If you fancy a bit of something extra to dip your halloumi slices into, pour a little bit of sweet chilli sauce on the side and thoroughly enjoy.